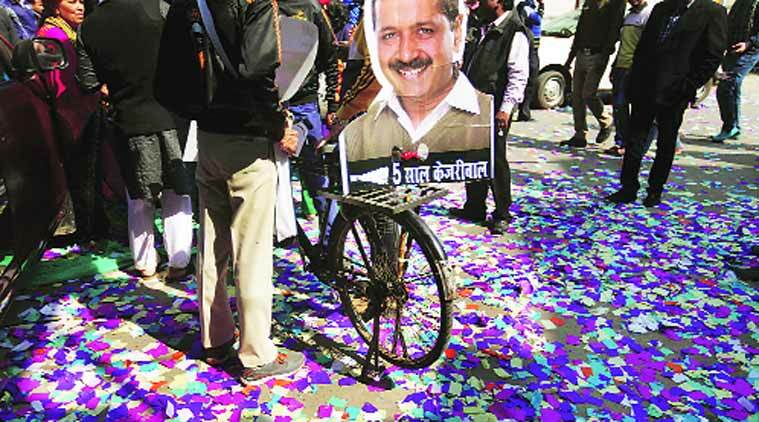 Although the AAP leadership was confident of victory on the counting day, backed by predictions of most exit polls, many in the party admit that the margin of the win came as a pleasant surprise. Party leaders said the 67-seat haul will now give Chief Minister-elect Arvind Kejriwal leeway to take a number of decisions without worrying about political expediency. Sources within the party said that ever since polling day, most leaders in the party, including Kejriwal had believed that though they would win, their tally would be within 45 seats. “Arvind Kejriwal had told several people that a haul of around 45 seats would give him room to take hard decisions, without worrying about the consequences. This win gives him complete freedom on issues of selecting the cabinet and other sticky issues,” a senior leader said. Had the the party not managed such a large majority, many in the party believe that Kejriwal would have had to accommodate MLAs who arrived from other parties, especially in the rural areas. “These are influential local leaders, who gave us results in the rural belt where we had not done well in the 2013 elections. If they had asked for ministries in a wafer-thin majority, it could have been a problem. However, Kejriwal has expressed his view that there has to be technical and expertise laden cabinet, and that selection will no longer be a problem,” a senior leader said. 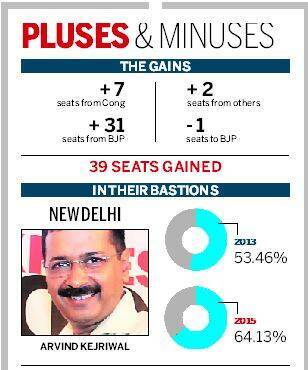 The seatshare also buys the AAP time to implement policy, leaders said. “In the earlier AAP government, there was always the worry that if decisions were not taken fast, the public sentiment would turn against us. There are things that can be done immediately, like the ordering of a CAG audit on power discoms and the helpline for corruption. Others which need systemic change, there is now time to do without worrying about the stability of the government,” a party leader said.